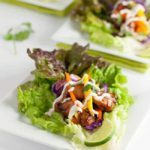 These Paleo Thai Chicken Lettuce Wraps with Cashew Cream have all the flavours you love in a regular wrap, without the gluten or dairy! Every culture has a favourite snack designed to be eaten with your hands. American have hamburgers and sandwiches. Mexicans have tacos and burritos. The Italians have pizza, the Vietnamese have Bahn mi, the Greeks have gyros. It’s fun to eat with our hands, but did you know it’s a healthy practice, too? Eating with our hands promotes mindful eating. We have to focus on what we’re doing and pay attention to each bite. It also protects us from eating food that is too hot and burning our mouths. Our fingers are excellent temperature sensors and they allow us to gauge the temperature of our food. Many foods designed to be eaten with our hands are made with some form of bread. 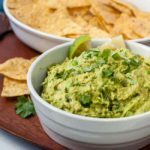 If you’re following a gluten-free diet, these foods just aren’t options for you. Step in, lettuce wraps! 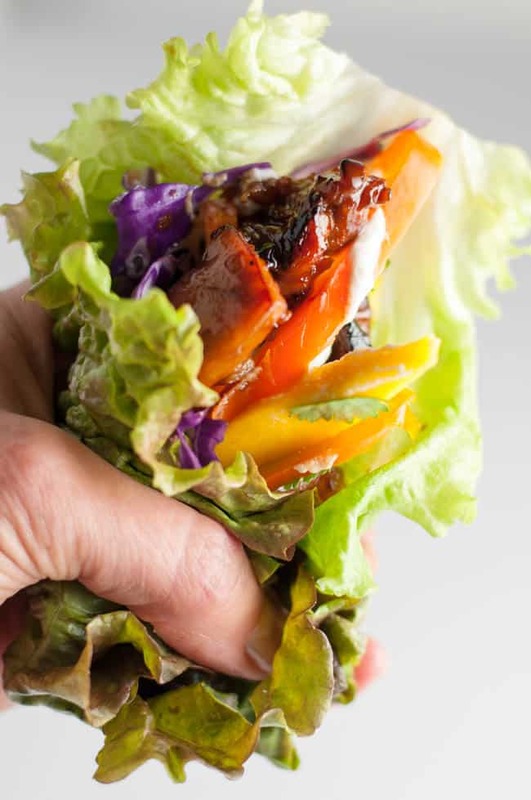 These Thai Chicken Lettuce Wraps let us have all the flavours we find in a bread-based wrap without the wrap itself. Now I’m not for a minute suggesting that lettuce is a perfect substitute. 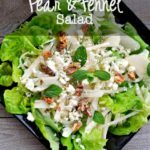 It can be messy, and depending on the lettuce you use, it can be fragile. 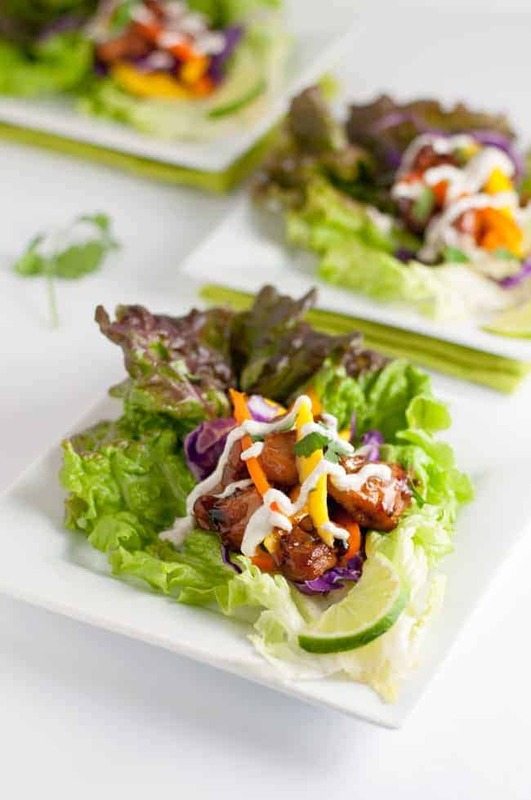 But today, these Thai chicken lettuce wraps provided all the Thai flavours we love without a wrap. 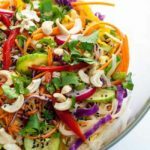 Crunchy cabbage and peppers, sweet mango and spicy succulent chicken, all wrapped up in a crisp lettuce leaf and drizzled with a garlicky cashew cream made for a satisfying light dinner. This recipe requires a little planning ahead of time. Soak the cashews in enough water to cover and let them sit on the countertop for 2 – 4 hours. This not only softens them and makes them easier to digest, but it helps to release any potential toxins too. Cashews are a soft nut, so they don’t require soaking as long as other nuts. Then drain the water, transfer the cashews to a food processor, add fresh water, and optional seasonings listed in the recipe below. The marinade I used for the chicken is one of my all-time favourites. I originally used it in these grilled Easy Thai Chicken Skewers. It’s sweet, it’s salty, and it’s spicy. I hope it becomes one of your favourites, too. 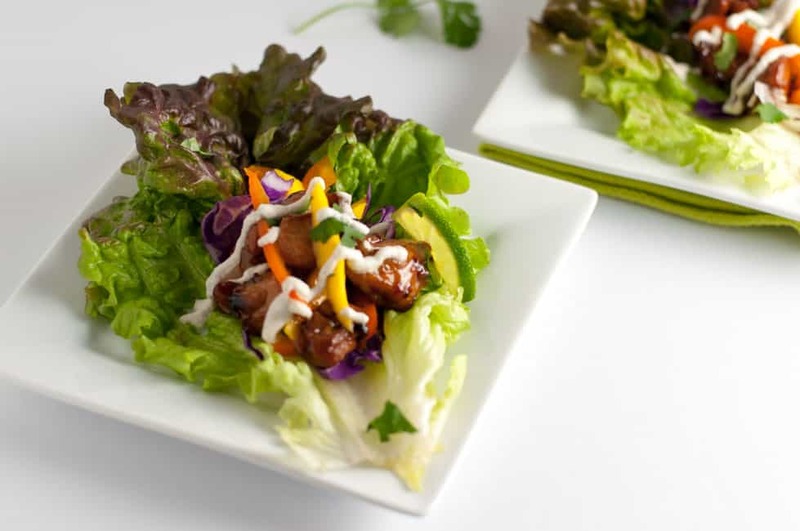 Sweet, spicy, salty, succulent chicken is wrapped up with crunchy vegetables in a crisp lettuce leaf to make a gluten-free wrap. 1 cup cashews soaked in water for at least 2 - 4 hours or overnight. Cut chicken into small cubes. Add to marinade and refrigerate for at least one hour. Meanwhile, prepare Cashew Cream. Drain the soaked cashews and transfer to food processor with remaining cashew cream ingredients. Process, scraping sides of bowl occasionally until it is very smooth and creamy. Transfer to a squeeze bottle or jar. Heat a medium skillet over medium-high heat. Add a tablespoon of oil and heat. Add chicken and heat until cooked through and browned, about 15 minutes. 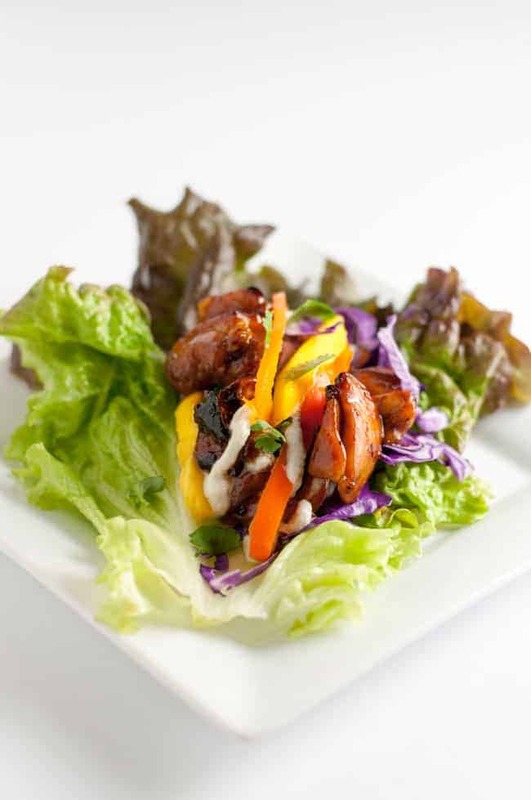 Assemble lettuce wraps: arrange cabbage, mango, bell pepper and chicken on each leaf, drizzle with cashew cream. 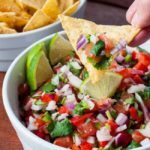 Squeeze with lime and sprinkle with finely chopped cilantro leaves. Roll the top of the leaf over the filling and fold the sides in, as you would fold a tortilla. Serve with napkins.